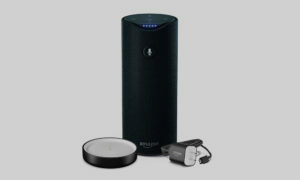 The Amazon Tap Speaker has been affectionately dubbed the younger sibling of the Amazon Echo, as it is a new addition to the Alexa family. It has many of the same capabilities, but is notably much more portable. Weighing in at just over one pound, this small but powerful speaker can be tucked away into a bag and then spontaneously brought out for up to 9 hours of playback time before needing to be returned to its charging cradle. With a tap, Alexa comes alive. You’re welcome to ask her to play music, read the news, provide weather reports, and much more. Music services include Prime Music, Spotify, Pandora, iHeartRadio, and TuneIn in addition to a Bluetooth capability, which allows you to stream music from your smartphone or tablet. Ultra crisp sound is made possible by Dolby dual stereo speakers that provide 360º omni-directional audio. This speaker is always getting smarter, urging users to keep returning. The small and stylish Under Armour Fitness Band measures sleep, resting heart rate, steps, and workout intensity while paired with Under Armour Heart. This fitness accessory is smarter than it looks, using resting heart rate to measure sleep duration and quality and alerting you when you’ve been inactive for too long or you’re close to reaching your step goal. All of this data is compiled into a workout log easily accessible through the Under Armour App. The Band display is capable of staying on during workouts and is able to deliver phone notifications, including texts, caller ID, and calendar notifications via Bluetooth. With automatic sync, water-resistance, and a bonus alarm clock feature, you’ll never want to take the Under Armour Fitness Band off. The Jawbone UP3 Activity Tracker is perhaps the most attractive tracker out there, coming in a large variation of styles and colors. In addition to this stylishness, the tracker bracelet is also lightweight and comfortable. These aesthetic features are accompanied by high tech fitness tracking. The band tracks steps and movements, calculating calories burned, heart rate and passive heart rate, and sleep, measuring deep, light, and REM. All of this data can be viewed in the companion app where you can also add friends for competition and additional motivation. 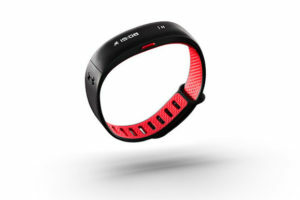 Smart Coach is a feature unique to the Jawbone UP3 Activity Tracker. As your personal trainer, the function gives you tips on sleep, exercise, and diet, encourages you to make informed healthy choices, and celebrates with you when you reach your goals. These are not generic messages. 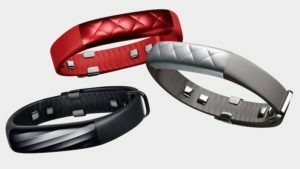 SmartCoach actually becomes more personalized the more you wear the Jawbone UP3 Activity Tracker, encouraging you to keep wearing it in order to keep getting fit. 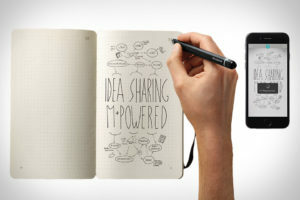 The Moleskine Smart Writing Set consists of a specially designed notebook that works together with a smart pen and App to instantly digitize notes and sketches made on paper in real time. The Paper Tablet notebook feels like a regular paper notebook, but is designed to look a tablet with rounded pages. The thick paper uses invisible NCode™ technology by NeoLAB Convergance embedded within each page that allows the Smart Pen+ to recognize exactly where it is inside the Paper Tablet notebook. The Smart Pen+ itself is a slim aluminum pen with a hidden camera that traces and digitizes writing. These handwritten notes can also be paired with real-time audio recording. The companion app allows for playback of synced notes and voice recording. You are also able to digitally edit and share your creations with a smartphone or tablet. The Moleskine Smart Writing Set stands out as a device that is discrete and naturalistic without losing the advanced technology modernizing writing by hand. 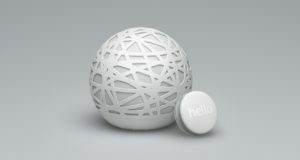 The Hello Sense Sleep Tracker comes with one Sense, a small white sphere to be placed on a nightstand, and a Sleep Pill, a small companion tracker which is to be clipped to your pillow. An ambient sound function helps you to fall and stay asleep throughout the night, providing you with the white noise of your choice. While the Sense monitors your environment including temperature, humidity, light, nosie, and air quality, the Sleep Pill recognizes your movement, interpreting this information to evaluate your sleep quality. The Sense is also equipped with a Smart Alarm which monitors your sleep cycle and identifies the best time to wake you up each morning, leaving you feeling refreshed rather than groggy. All of this data can be reviewed in the companion app which allows you see sleep patterns over time. You are also given personalized insight that helps you make more informed decisions concerning your sleep environment and sleep hygiene. If you sleep next to a partner, an additional Sleep Pill may be added without interference. With nothing to wear or change, the Hello Sense Sleep Tracker is a great alternative to other fitness bands and trackers. For more corporate gift giving ideas, consider checking out articles by Event Manager Blog and The Edison Ballroom. For items not yet available in your location, please consider using Big Apple Buddy as your personal shopping concierge service. Learn more about our service or get a free shipping quote for a unique tech gift today!